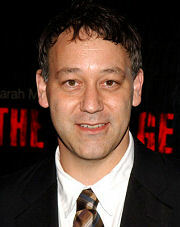 Samuel Marshall "Sam" Raimi (born October 23, 1959) is an American film director, producer, actor and writer. He is best known for directing cult horror films like the Evil Dead series and Drag Me To Hell as well as the blockbuster Spider-Man films. Raimi, the fourth of five children, was born in Royal Oak, Michigan, and grew up in Birmingham, Michigan. He is the son of Celia Barbara (née Abrams), who owned lingerie shops, and Leonard Ronald Raimi, who owned home furnishing stores. Raimi was raised in Conservative Judaism; his ancestors immigrated from Russia and Hungary. Raimi's eldest sibling, Sander, died in a swimming accident in 1968 at age fifteen. His elder brother, Ivan Raimi, is an emergency room doctor and screenwriter who sometimes collaborates with Sam. His brother, Ted Raimi, is an actor and played J. Jonah Jameson's assistant Hoffman in all three Spider-Man movies. His older sister, Andrea Raimi Rubin, is a stenographer and is not involved in the film industry. Raimi attended Wylie E. Groves High School, and Michigan State University and majored in English, leaving after three semesters to film The Evil Dead. Raimi became fascinated with making films when his father brought a movie camera home one day and he began to make Super 8 movies with childhood friend Bruce Campbell. In college, he teamed up with his brother's roommate Robert Tapert and Campbell to shoot Within the Woods (1978), a 32-minute horror film which raised $350,000, as well as the short comedic film It's Murder!. Through family, friends, and a network of investors Raimi was able to finance production of the highly successful horror film The Evil Dead (1981) which became a cult hit and effectively launched Raimi's career. He began work on his second film Crimewave (1985), intended as a live-action comic bookthe film was not successful, due in part to unwanted studio intervention. Raimi returned to the horror genre with the seminal Evil Dead II (which toned down the savageness of the original in favour of slapstick, showcasing his love of the Three Stooges). A long-time comic book buff, he attempted to adapt "The Shadow" into a movie, but was unable to secure the rights, so he created his own super-hero, Darkman (1990). The film was his first major studio picture, and was only moderately successful, but he was still able to secure funding for Evil Dead III: Army of Darkness, which turned away almost totally from horror in favor of fantasy and comedy elements. In the 1990s Raimi moved into other genres, directing such films as the western The Quick and the Dead, the critically-acclaimed crime thriller A Simple Plan (1998) (starring Bill Paxton and Billy Bob Thornton), and the romantic drama For Love of the Game (1999) (starring Kevin Costner). Raimi achieved great critical and commercial success with the blockbuster Spider-Man (2002), which was adapted from the comic book series of the same name. The movie has grossed over $800 million worldwide, spawning two sequels: Spider-Man 2 and Spider-Man 3, both directed by Raimi and both grossing roughly $800 million each. After the completion of the third Spider-Man film, Raimi is slated to direct a film adaptation of The Wee Free Men by Terry Pratchett. Prior to directing the Spider-Man films, Raimi lobbied to direct Batman Forever when Tim Burton was ousted from the director's chair, but was rejected in favor of Joel Schumacher, whose reputation at the time outshone Raimi's. Raimi frequently collaborates with Joel and Ethan Coen, beginning when Joel was one of the editors of Evil Dead. The Coens co-wrote Crimewave and The Hudsucker Proxy with Raimi in the mid-1980s (though Hudsucker was not filmed for almost a decade). Raimi made cameo appearances in Miller's Crossing, The Hudsucker Proxy, as well as with Joel Coen in Spies Like Us. The Coen brothers gave Raimi advice on shooting in snow for A Simple Plan, based on their experiences with Fargo. He has also worked in front of the camera with Miller's Crossing as a coldblooded gunman, The Stand as a dimwitted hitman, John Carpenter's Body Bags in an unusual role as a gas station attendant (all three roles saw Raimi dying in distinct ways), and Indian Summer in what is perhaps his biggest role as a bumbling assistant to Alan Arkin. The film was written by his childhood friend writer-director Mike Binder and shot at the camp that they both attended when they were younger. He also produced The Grudge, The Grudge 2 and The Grudge 3. According to Entertainment Weekly, Raimi had expressed an interest in directing a film version of The Hobbit, the prequel to the Lord of the Rings trilogy. In 2008, Guillermo del Toro was selected as the director, with Peter Jackson as the executive producer. Raimi may direct By Any Means Necessary, the next film based on the "Jack Ryan" CIA character created by Tom Clancy. Disney also approched him to direct W.I.T.C.H. The Movie, based on the popular same-name comic. Blizzard Entertainment announced on July 22, 2009 that Sam Raimi will be directing a film based on the Warcraft universe. In addition to film, Raimi has worked in television, producing such series as Xena: Warrior Princess, featuring his younger brother Ted Raimi and long-time friend Bruce Campbell, Hercules: The Legendary Journeys, American Gothic, Cleopatra 2525 and Jack of All Trades. In 2008, it was announced at Comic-Con in San Diego that Raimi would be executive producing a new syndicated TV series called "Legend of the Seeker," based on Terry Goodkind's best-selling The Sword of Truth fantasy series. In his film and television projects, Raimi's brother Ted Raimi and his friend Bruce Campbell often appear in on-screen roles, though these appearances are often just short cameos. The trio have been working together since their college days. Both Ted and Bruce have appeared in all three Evil Dead and Spider-Man movies, as well as Xena: Warrior Princess, which Sam produced. In the Dead films, Campbell plays the recurring star role of Ash, while Ted played various small parts every time. In the Spider Man films, however, Ted plays Daily Bugle advertising manager Ted Hoffman, while Campbell has played different roles every time. In Xena, Ted and Bruce played the recurring roles of Joxer and Autolycus. 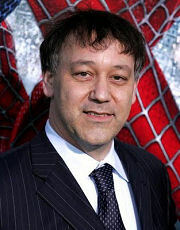 Raimi occasionally appears on-screen in his own movies, usually in similar fashion to the cameos made by his idol Alfred Hitchcock: A silhouette behind a projection screen (Spider-Man, in the wrestling scene), a passer-by with some kind of physical interaction with the film's protagonist (Spider-Man 2, as the student whose bookbag hits Peter Parker in the back of the head), a hitchhiker in The Evil Dead. Raimi also wears a suit with white shirt and tie on-set in another homage to Hitchcock. An adept fan will also notice Raimi's recurring usage of soda crackers as a back prop. Raimi often works with film editor Bob Murawski, a fellow Michigan State University alumnus; among Raimi's films edited by Murawski include the Spider-Man movies, The Gift, and Army of Darkness. Raimi has included a 1973 yellow Oldsmobile Delta 88 automobile (nicknamed "The Classic") in every film except The Quick and the Dead. Bruce Campbell, at Comic-con 2005, advised that a special covered wagon frame had covered the vehicle to maintain the motif of the film. A bottle of Maker's Mark also appears regularly in his movies. In the Making The Amazing documentary on the Spider-Man 2 DVD, both Tobey Maguire and Bruce Campbell jokingly describe Raimi's penchant for "abusing" actors: In order to get realistic closeups of a character getting hit by debris, Raimi usually stands just off-camera throwing items, swinging tree branches, etc., at the actor who is at the center of the shot. Scenes from the documentary show that Raimi is the one throwing popcorn at Peter Parker during the walk to the wrestling ring in Spider-Man and tossing gold coins around during the bank robbery scene in Spider-Man 2. This technique was parodied by Spider-Man actor James Franco in his Funny or Die series, Acting with James Franco, Episode 2: "Green Screen". Raimi has been married since 1993 to Gillian Dania Greene, daughter of actor Lorne Greene. They have five children. Three of the Raimis' children (daughter Emma Rose and sons Lorne and Henry) appeared as extras in Drag Me to Hell and Spider-Man 3 during the movie's climactic final battle. 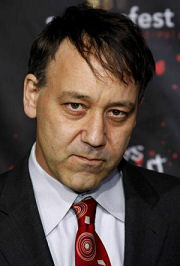 On occasion, Raimi collaborates with his elder brother Ivan, a doctor and occasional scriptwriter. Together, they co-wrote the screenplays for Drag Me to Hell, Darkman and Army of Darkness and fleshed out most of the plot for Spider-Man 3. Ivan also contributed to story and script development for the three Spider-Man films. He has claimed his three favourite films to be Treasure of the Sierra Madre, The Big Lebowski and Psycho. Raimi is recorded as having made several political contributions: to Arlen Specter in 1996, Barbara Boxer in 2002 and George W. Bush's presidential campaign in 2004. Outweighing amounts to those politicians are donations to the political action committee of the Director's Guild of America.